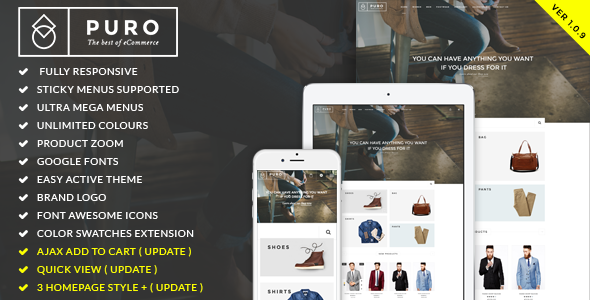 This March, IcoTheme is so proud to introduce you with a completely new Magento theme, named Puro. That will be a smart solution for any shop master to improve their business. Puro Theme is amazing and ideal for any fashion, watch, jewelry or any types of shops. It is made up of many dynamic features, modern extensions, especially Ultra Mega Menu, Color Swatches, and Blog integrated which is a very powerful Magento color selector module that assists you to present products to stand out in competitive crowd. Besides, Puro also offers product widgets to help users have more great experience. This responsive Magento Theme stands out from other by its modern and elegant design. Full-width slider is eye-drawing, banner static with nice visual effects, responsive design…all turn your store into a luxurious and attractive heaven. As words can describe exactly how awesome Puro is, let’s try our latest demo and have your own review about it! We guarantee that we will continue to update and improve this theme to keep it the best theme for Magento. Please take a look at the list of updates to see how fast Puro evolves. * Add new homepage layout. * Fix the issue when hitting the setting icon on Iphone. * Fix responsive issue when viewing theme on Tablet. * Fix issue with "add to cart button" on detail page. * Fix issue not showing the correct number of Product Per Page and no option to go to another page. * Add search box to always display on every page. * Fix the issue when grid view doesn't work on category page. * Fix issue when "Active theme"